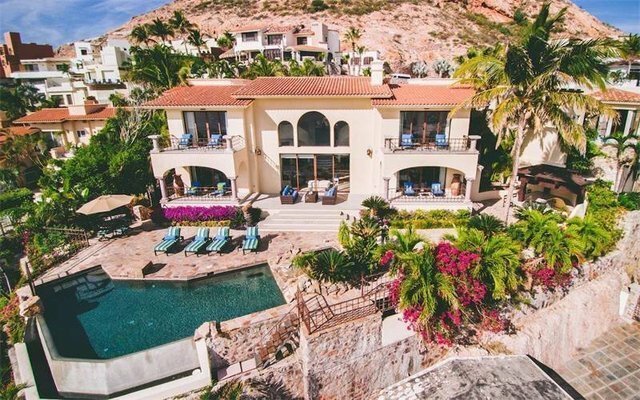 Majestic and singular in every way, Casa Grande in beautiful Cabo Colorado overlooks secluded white-sand beach and infinite blue sea. With expansive, soaring public spaces, three master suites, two additional sleeping quarters, five full baths and 2 half baths in approximately 4800 AC square feet, this exceptional home provides as much intimate privacy and room for splendid festivity as anyone could hope for.The great room features 20-foot, massively beamed ceilings, lovely cantera fireplace, and dual sweeping staircases to ascend and descend in style. Catch sun and moon rises from bed, or from the flagstone infinity pool deck. Easy beach access from the pool patio area. Opulent finishes and features abound; among them, elegant, comfortable furnishings, whole-house water filtration, oversized 2-car garage, Viking range in the superb, wide-open chef's kitchen, and more fine details than can be listed here. Stunning Casa Grande offers truly regal escape in one of Los Cabos' best locales.